Every day in Maryland, pedestrians who are crossing in a crosswalk, jogging down the street, walking through a parking lot and even walking on the sidewalk are stuck by a cars or trucks. Obviously, a pedestrian does not have the luxury of a seat belt, the steel protection of a car, or even the luxury of a motorcycle helmet. There are several dangerous areas where pedestrians are at higher risk: near the confusion of a construction site, while crossing the street (especially when there is no crosswalk), while walking alongside a road (and not on a sidewalk). Some professions, activities, and demographics that are high risk for pedestrian impact injuries include utility workers, landscapers, police officers, garbage collectors, runners, the elderly (because it takes them longer to cross the street, and they are sometimes less able to evade negligent drivers) and children. Maryland is a particularly dangerous terrain for pedestrians. 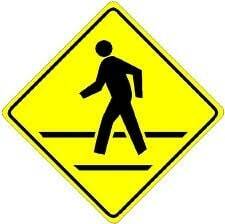 For such a small state, Maryland is the 7th riskiest state to be a pedestrian. Contrary to popular belief, a police report is typically not evidence in a pedestrian accident lawsuit. The report, which may have a police officer's opinion about whether the pedestrian was at fault in the collision, is usually inadmissible in court. This lack of admissibility of the police report is a good thing in many pedestrian accident cases. Most police officers do not understand the deference Maryland law gives to pedestrians. Most pedestrian accident cases hinge on whether the pedestrian was lawfully where he was at the time of impact. This is particularly the case if the pedestrian is hit while crossing the street. The defense will be that the pedestrian ambled across against the signal, or crossed outside of a crosswalk. Defense lawyers in Maryland pedestrian accidents often contend that the pedestrian was a jaywalker and is contributorily negligent. In Maryland, a victim who is even 1% negligent is not allowed to recover in a civil lawsuit. Defense lawyers pull out all of the stops and try to convince a jury that the pedestrian was distracted (using a cell phone or MP3 player) Often, a good, quick investigation after the crash can destroy these defenses. One important question in Maryland pedestrian accidents is whether there is any insurance coverage to pay for the pedestrian's injuries. The simple case is where the negligent driver has insurance - that driver's insurance will be responsible for paying for the walker's injuries. If the at-fault driver does not have insurance, flees the scene and cannot be found (hit-and-run accident), or has low insurance that won't cover the full cost of the pedestrian's injury, then the pedestrian's automobile insurance policy will kick in if it has uninsured/underinsured coverage. If the pedestrian does not have automobile insurance and does not live in a household with a family member who has uninsured/underinsured coverage, then the pedestrian can recover from the Maryland Automobile Insurance Fund's (MAIF) Unsatisfied Claim and Judgment (UCJ) division. MAIF may be responsible for paying up to $30,000 for pedestrian accidents where the negligent driver is uninsured or cannot be located. Pedestrian accidents are among the most serious motor tort accident cases we have, along with truck accident cases. The makeup 9% of auto tort cases and probably an even larger percentage of Miller & Zois' cases. Below are Maryland settlements and verdicts in pedestrian accident cases. Many of these are death cases which are not uncommon: 23% of vehicular accident cases are wrongful death claims. These verdicts and settlement payouts are presented to give you a better idea of the value of pedestrian accident cases. But, we have to be honest about the limitations of this kind of data. There are too many variables to compare one case to another to assume that if the cases are similar, they have a similar value. One case just cannot predict another. $1,000,000 Settlement. A woman is pushing her infant son on the sidewalk in Baltimore and is struck by an Allstate insured driving a pickup truck that overshot his U-turn. The mother was killed; the child was untouched. Miller & Zois attorneys handled this case on behalf of the surviving child. $663,000 Verdict. A young woman is hit by a car walking across a driveway entrance in Baltimore County. She develops Reflex Sympathetic Dystrophy (RSD). State Farm offers $20,000, basically arguing that the woman was not hurt. A Towson jury strongly disagreed. Miller & Zois handled this case. $200,000 Settlement. An elderly man in his mid-80s was parked his car and, while looking to cross, was hit and killed. The driver claimed he was in the middle of the roadway dressed in dark clothes. There were no witnesses to the accident and little physical evidence that accident reconstruction experts on either side could point to as proof of exactly where the man was on the roadway at the time of the accident. Even without any witnesses to show the defendant was negligent, Miller & Zois still secured a $200,000 settlement for a very grateful family and referring lawyer who could not get any settlement offer on the case because the family could not produce any real evidence. $135,000 Settlement. Plaintiff, a 76-year-old woman, sustained a severe fracture of the right knee after being struck in a parking lot. She additionally developed health issues - specifically a staph infection - as a result of her hospital stay for the fracture. The Defendant, insured by State Auto Insurance, denied that she made any contact with the Plaintiff. Plaintiff’s expert, however, opined that her injury was consistent with having been struck by the car. The case settled at mediation for $135,000. Miller & Zois handled this case. We provide sample settlements both to victims and fellow plaintiffs lawyers an opportunity to gauge the value of these cases and to demonstrate our experience in handling pedestrian crash claims. But the utility of applying a few example case resolutions to your individual case is, of course, limited. The outcome of one case cannot accurately predict the result of another claim. Every case is going to be valued on a host of different factors that may or may not be included in these brief verdict summaries. If you have been injured in a serious pedestrian accident in Maryland, call us at 1.800.553.8082, or click here for a free consultation/case evaluation. Baltimore is the state capital of pedestrian crashes. Learn more about pedestrian issues specific to Baltimore and learn about the settlement and trial value of pedestrian cases in this jurisdiction.